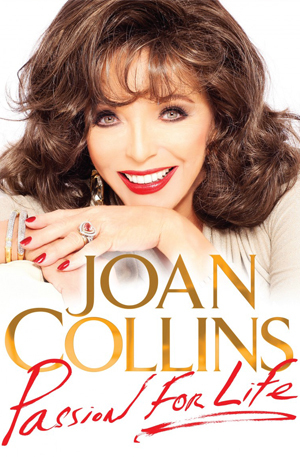 Having seemingly lived many different lives when most of us only live one, the stories of Joan Collins’s adventures on film sets around the world, the friendships she made, the triumphs and the near disasters could fill many books. Encounters with Princess Diana, Arnold Schwarzenegger and the romantic story of her courtship and marriage to Percy Gibson are among the new stories Joan shares, in this latest instalment of her witty, wise and revelatory memoirs. Fully illustrated with wonderful photographs documenting her unique life, the screen icon reveals details of her life with her fifth (and final) husband Percy, her travels around the world, fun with family and friends and shares more revealing anecdotes about the fascinating people she has met over the years. Passion for Life is – quite literally – an expression of the joie de vivre which Joan exudes. Filled with fabulous never-before-seen images of her life, from childhood to recent holiday snaps with Percy and her children, this is the ultimate illustrated guide to the technicolour life of a British icon.